Edwin, a 6 month old male intact domestic medium haired cat, presented to Oswego Animal Hospital for an examination. Edwin was previously an outdoor cat that came from a rural community. The owners noticed both his ears were dirty and that he scratched them frequently. On presentation, Edwin was examined and found to have excoriations (scratches) in both of his ear pinnas and on the skin surrounding his ears. There was an excessive amount of dark black “coffee ground” debris filling both ear canals. 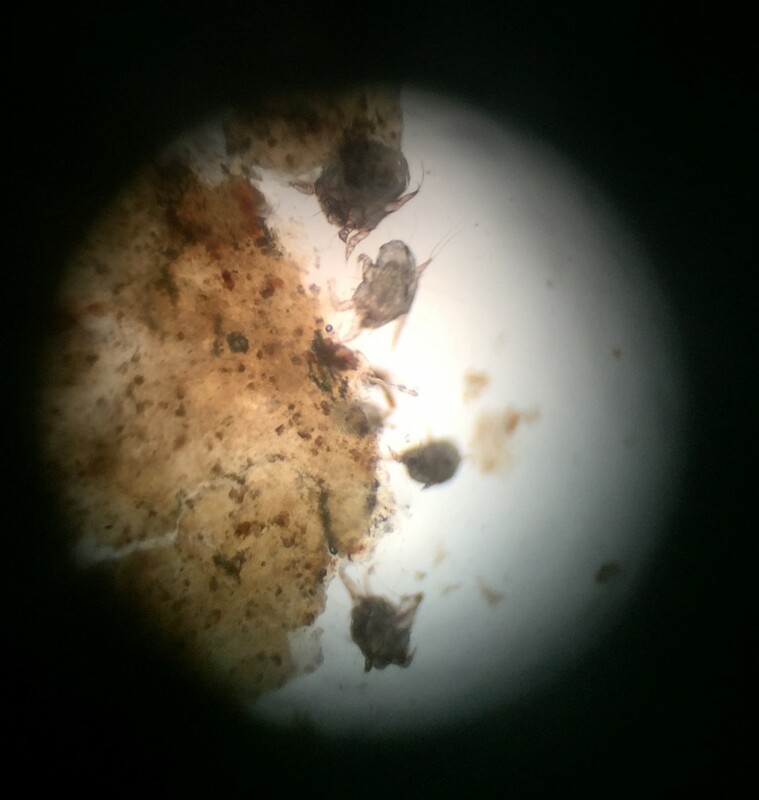 A sample of the otic debris was collected for microscopic examination, which revealed numerous living mites present (see image) and excessive ear wax. These mites were identified as Otodectes cynotis, known commonly as ear mites. Ear mites are a mite that may inhabit the ears of mammals. All mammals may be infected by ear mites, but they are most commonly seen in cats, dogs, rabbits and ferrets. Ear mites are highly contagious amongst pets and are not species specific. Some pets may be asymptomatic carriers of the mite, meaning they show no clinical signs, but may spread the mite amongst other pets. Ear mites for the most part live in the external ear canal and cause irritation through mechanical damage and increased production of ear wax (cerumen). However, ear mites may migrate outside of the ear canal and inhabit skin on other areas of the body. Signs of an ear mite infestation may include scratching the ear, head shaking, drooping of the ear, or accumulation of excessive cerumen within the ear. Untreated cases of ear mites are not only uncomfortable to your pet but can lead to more serious problems such as permanent scarring of the ear canal and formation of aural hematomas. Aural hematomas occur when small blood vessels are ruptured in the ear, typically due to self trauma from scratching. When the vessels rupture, blood accumulates in the ear creating a large, often painful, swelling in the ear pinna that may require surgical repair. Fortunately, ear mites are readily diagnosed, as Edwin’s were, with microscopic examination. Once an infestation is confirmed, the first step in treatment is to clean the ears, allowing removal of excess cerumen. Next, a parasiticide is used to kill the ear mites. There are a variety of treatments for ear mites including topical and systemic therapies. However, since ear mites can live outside the ear the most effective treatment is with systemic parasiticides. My favorite product to use is with a topical medication called Revolution (selamectin), which is applied on the skin between the shoulder blades. Revolution is used to prevent fleas, ticks, and heartworm disease in addition to treating, and preventing, ear mites. Since ear mites have a 3 week life cycle, it is usually required to repeat treatment in 2-4 weeks to ensure elimination of all mites. In addition, all mammals that were in contact with the affected animal should be treated. Edwin’s ears were gently cleaned with ear cleaning solution and the rest of the otic examination was completed, which revealed moderate inflammation of the ear canals with intact ear drums. A topical dose of Revolution was applied between his shoulder blades to treat his ear mites. Edwin returned several weeks later for a follow up examination where his ears were completely normal and the owners report no additional itching. Edwin was placed on monthly Revolution for prevention of fleas, heartworm disease and recurrence of ear mite infection. If you suspect your pet has ear mites or other problems with the ear, they should promptly be brought to your veterinarian for testing and treatment, which will help reduce risk of complications such as development of aural hematomas or permanent scarring of the ear canals.